Oghash gra-Magul is an Orc rogue living in Cheydinhal, who runs drugs to the Camonna Tong and brings the profit back to her gang's boss. The gang is led by Dulfish gro-Orum and also contains Magub gro-Orum, Bazur gro-Gharz, and Borba gra-Uzgash of Borba's Goods and Stores, but none of them except Oghash do anything to help. For most of the week, Oghash lives a crime-free life in town. She wakes at 10am and walks around her house for a couple of hours before eating lunch in Newlands Lodge. At 2pm she goes looking for Dulfish, starting in Magrum gra-Orum's house, spending two hours tracking him down and following him around before heading back home. She heads back to Newlands Lodge at 8pm for dinner and then goes back home again, where she paces restlessly until heading back to Magrum's house at 2am. She spends two hours outside the house and then it's time to go back home once more for bed. 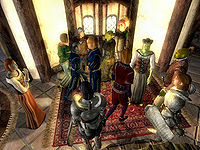 On Tirdas, Oghash wakes at 6am and sets off for the Imperial City. She heads off down the Blue Road then turns north onto the Red Ring Road, heading right around the north side of Lake Rumare before walking across the Talos Bridge into the city. This journey takes her most of the day, and she usually arrives in the Imperial City at about 8pm. She then walks to the Waterfront District and mounts the Orum Gang's Paint Horse, riding it across the causeway into the main part of the district. 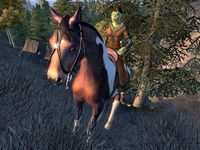 When she reaches the housing area of the district, she rides slowly around the area looking for skooma. Whether or not she finds any, she resumes her normal schedule at 6am the next day, leaving the horse at the tunnel door back to the city. On Fredas, she leaves Cheydinhal at 6am and heads up to Walker Camp. 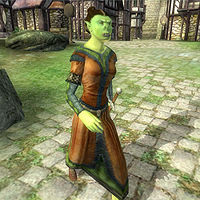 Once there, she hands over all her Skooma in return for whatever gold the primary Camonna Tong Thug is carrying. Later the same day, at 10pm, she will hand over the gold to Dulfish. Oghash wears a middle-class outfit consisting of a russet felt outfit and a pair of thick cowhide shoes. She wields an iron shortsword, and carries the key to her house as well as a medium amount of gold. Oghash knows a leveled set of rogue spells. The members of the Orum Gang other than Borba are all quite rude and unapproachable. Oghash is no exception. When you engage in conversation with her, she will simply say: "Yeah? You're who? And why do I care, exactly? Yeah. I don't need you. So go away, huh? I'm asking real nice, because my mom brought me up right." When asked about Cheydinhal she will reject you with the words: "What are you asking me for? Do I look like Vile's dog or something? Go on. Knit a doily or play a flute or something." Oghash owns a second paint horse in Brindle Home. This seems to be a mistake on the part of the developers, who appear to have copied and pasted the Cheydinhal Stables cell without changing ownership. While seeking out Dulfish on a Loredas, Oghash will usually follow him to the weekly party held at Riverview. The thug hands over all his gold in return for however much skooma Oghash is carrying. This should have been related to the number of skooma she carries. When handing the profits to Dulfish, Oghash is supposed to keep 100 gold for herself. She doesn't, and hands over all the cash. Esta página foi modificada pela última vez à(s) 07h40min de 1 de junho de 2015.